Shakespeare Machine Stamping of Wisconsin Product Listing Catalog. 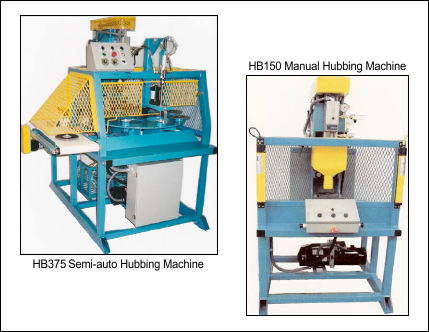 The HB375 Semi-Auto Hubbing Machine consists of a turntable with 8 nests for hex end of hub. Has adjustable index time depending on operator. The HB150 Manual Hubbing Machine consists of electric motor driven hydraulic powered drill for hub roll over operation. Manually loaded and manually activated cycle then manually unloaded. Cycle start signal with optional output for customer supplied epoxy dispense operation. Supplying Quality Components used in the Manufacture of Abrasive Wheels. Visit our Sister Companies Ace Stamping for all your Precision Metal Stampings, Innotec for High Quality Specialty Tapes and Heinrich Co. for Workholding and Metalworking Tools. Ace Stamping, Innotec and Heinrich are divisions of Shakespeare's Parent Company, RC Incorporated.